The Friends of OASC Scholarship Program has partnered with BottleDrop to raise money for students to attend Winter Energizer and Summer Leadership Camp. From November 20-December 20, Bottle Drop will match a percentage of funds donated through bottle deposits. 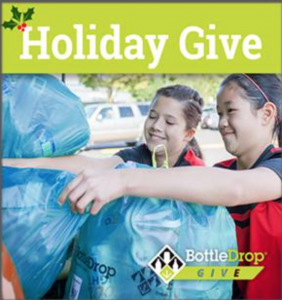 Please join us by picking up a blue donation bag at any BottleDrop location and donate your bottle deposit today! Help in 3 Simple Ways! Make the difference in the lives of Oregon’s youth by sending a student leader to an OASC summer leadership camp! All contributions are deposited into the COSA Foundation, to be used solely for camp scholarships—and contributions are tax-deductible! Download and Share our Fundraising Letter! Invest in the future… one student leader at a time. The Oregon Association of Student Councils (OASC) is a non-profit, member association serving middle and high school student leaders and advisors throughout Oregon since the 1950’s. We are affiliated with the Confederation of Oregon School Administrators (COSA) and the National Association of Secondary School Principals. A friend in OASC is a friend indeed! As resources have dwindled in our public schools, many programs are no longer being funded as they have been in the past. Leadership is no exception. Many schools previously paid a portion or the entire cost to send students to our Summer Leadership Workshops, which have been in existence for over 25 years. This is no longer the case. The burden has shifted to families, and although every effort is made to keep costs low, many simply cannot afford it. Consequently, many fine young leaders miss out on this excellent growth opportunity. Become a “Friend of OASC” by making a donation toward a camp scholarship. 100% of all donations will go toward scholarships. If checks are made payable to the COSA Foundation, they are tax deductible! You may designate who you wish the scholarship to go to, or allow us to select a person in need. Please check our website for current information about our camps, including curriculum, registration, and even a camp video and photos. Feel free to contact Program Director, Sara Nilles, 503-480-7206, or by email.